In the pages of DC Comics, the Speed Force is an extra-dimensional energy source from which the Flash and his fellow speedsters draw their powers. On The Flash, the concept remains essentially the same but the execution has been less than satisfying. In this week’s episode, Barry goes into the Speed Force (thus the ingenious title) in order to save Wally after he was trapped there by the wrathful Savitar the previous week. As much as anything, the Speed Force is used as a device by the writers to get Barry to confront his figurative ghosts on a literal level, as well as come to grips with his terribly important role as the Fastest Man Alive. So as you might’ve guessed from the foregoing plot synopsis, we’re still stuck following the Adventures of Mopey Barry. Regular readers of my Flash reviews will know that I coined the Mopey Barry moniker to describe a Flash that was obsessively fixated on blaming himself for the world’s problems. Granted, he had some hand in those problems in creating Flashpoint, a divergent timeline he inadvertently created in which unhappy events, like the death of Cisco’s brother, transpired. 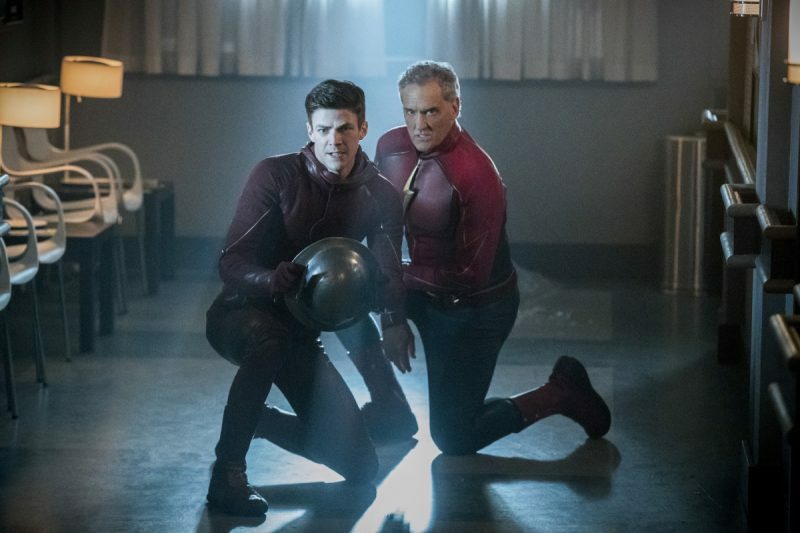 But after a several episode stretch in which Barry wallowed in his own guilt, it seemed as if both he and the show itself were coming out of it to be their normally bright and optimistic selves again. “Into the Speed Force” proves that this isn’t the case. As a way of setting the stage for the mopefest that is to follow, Barry begins with a “woe is me” monologue in which he takes responsibility for creating Flashpoint. This moment feels like a case of déjà vu for the viewer who’s already seen Barry continuously apologize for the revised timeline. Feeling responsible for getting Wally trapped in the Speed Force, Barry resolves to rescue him. Cisco uses his vibing powers to open a dimensional portal to the Speed Force—which, as a sidebar, is strange since Barry could just run fast enough to enter the Force himself—and thus begins his It’s A Wonderful Life-like tour of his past. First, he encounters Eddie Thawne (who died back in Season 1), who, in referencing Flashpoint, informs him that “choices have consequences.” Apparently the Speed Force is “angry” with Barry for mucking with the timestream and has decided to keep Wally as a form of punishment. As a viewer, you can tell that the plot has gone off the rails when it tries to anthropomorphize the Speed Force in this way. The brilliance of the Speed Force concept, as created by Flash creators Mark Waid and the late Mike Wieringo back in the early 90s, was its abstractness; the Speed Force was less a physical location or destination than it was a state of transcendence akin to Nirvana. But in “Into the Speed Force,” the complexity and mystery of the Speed Force is stripped away in favor of prosaic plotting that demands Barry go through an obstacle course of former friends and foes that are now deceased. 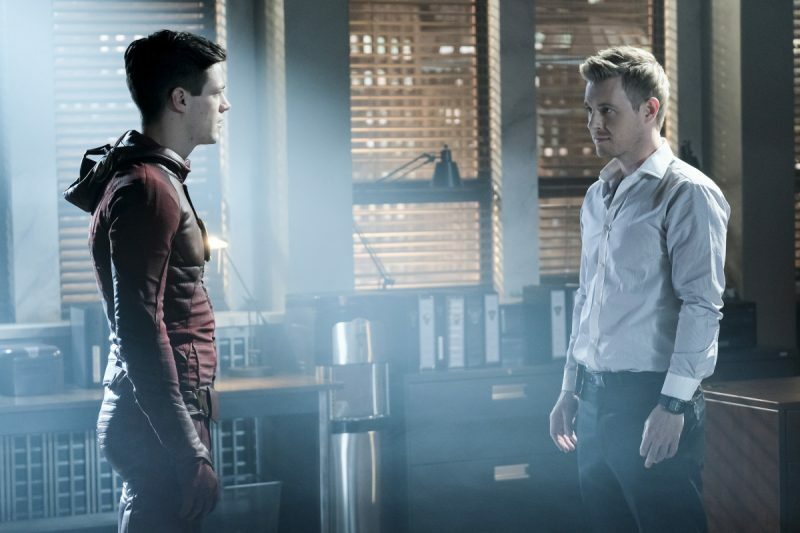 In addition to Eddie, Barry confronts Hunter Zolomon (aka Zoom) and Ronnie Raymond (aka Firestorm) before meeting the “final boss,” Leonard Snart (aka Captain Cold). Snart—or rather a version summoned by the Speed Force—is guarding the door to the room in which Wally is trapped in a recursive loop reliving his greatest tragedy: the death of his mom. Out of nowhere Jay Garrick (aka the Earth 3 Flash) appears to assist Barry in stopping Cold and saving Wally, which means taking his place in the Speed Force because apparently it, much like nature itself, abhors a vacuum. Seeing another Jay, yet another beloved character, trapped in an unending hell is a bummer, but overall you’d think Team Flash would be elated to see Wally again. What’s more, they even learn that Savitar is vulnerable to injury, thanks to an encounter Jesse has with the reputed God of Speed. This would seem to be a cause for celebration, right? And yet the episode ends on as huge a down note as it began. Jesse elects to leave Earth 1 shortly after Wally’s return—a weird turn of events given how much The Flash invested in their relationship over the past few episodes—and Barry breaks his engagement with Iris. The final scene between the two epitomizes the mawkishness and manufactured angst that has lately plagued the show; incredibly enough, Barry tells Iris how hard it’s been for him to deal with the prospect of Iris’s death (yeah, imagine how she feels, Bar!). The lesson Barry takes from his excursion to the Speed Force is that saving Iris’s life is his responsibility alone, which leads his decision to decommission Kid Flash until Wally is up to it. It’s hard not to think that Barry drew the entirely wrong conclusion about his mission and that he’ll realize in time that he needs the support of his team. But he’s learned that lesson before, hasn’t he? Much like Wally in “Into the Speed Force,” Barry is himself stuck in a recursive loop that prevents him from learning from his mistakes and, just as importantly, forgive himself for them. For now, unfortunately, it appears that Mopey Barry is here to stay. Will this episode finally serve as closure on Flashpoint and the dreaded Mopey Barry?